Malayalam actor Mammootty is basking in the glory of Yatra which has opened to phenomenal response across the world. Yatra has earned glowing reviews and positive word of mouth from critics and cine buffs. The movie is ruling the roost. Looking at the current scenario, there is no doubt, Yatra would surpass records set by few Telugu movies, particularly biopics by the end of its theatrical run. Recently, the makers of the movie were so happy with reception to Yatra that they thanked the audiences by holding a success meet last week for making it a splash hit at the box office. 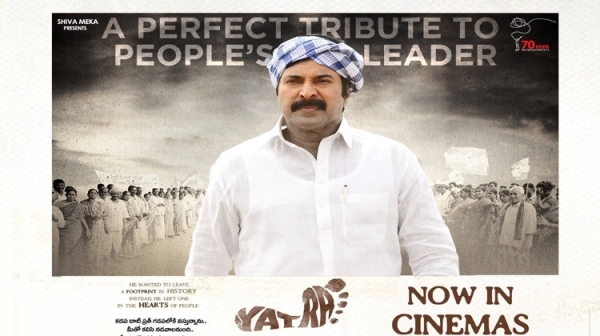 Yatra is a medium budget movie but Mammootty’s performance as YSR stands out. He has got into the skin of the character about fans are raving on social media platforms. Yatra is a tale about the journey of late Andhra Pradesh chief minister Dr YS Rajasekhar Reddy. His fans couldn’t be happier than witnessing the life of their idol life untold on the silver screen. It won’t be wrong if we said that Yatra has dethroned NTR Kathanayakudu which fizzled out at the box office. Talking about movie collections, the movie is reported to have earned approximately Rs 3 crore from the two telugu states. We wouldn’t be surprised if the movie fetched double than estimated price as it was a weekend. We are waiting for official figures which are yet to be known. On the other side, Yatra is performing well on foreign shores. It has managed to earn $54,807 on the third day at the USA box office. The film’s total business in the USA stands at $164,996.